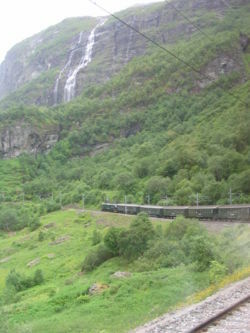 Flåmsbana is a branch line of Bergensbanen which runs between Myrdal and Flåm in the Aurland municipality in Norway. Because of the line's steep incline, and scenery, it is a major tourist attraction. Flåmsbana (Flåm Railway) was built in order to provide a line of communication between Sognefjorden and the main railway. The resolution to make such a line was passed in Stortinget in 1908 and the route was decided in 1916. The route chosen was a difficult one, construction on the line started in 1923 but the construction was not complete before 1947, although trains started operating on it a few years earlier. Eighteen of the twenty tunnels were dug out manually. The line was opened in 1940, but passenger traffic did not start before 1941. The line was electrified in 1944. Since the line was completed during World War II, the line was not "officially" opened then, and the official opening was in fact not till 1980. The operation of the line was privatized in 1998, though the line itself is still owned by the state through Jernbaneverket. The line is 20.2 km long. The top station Myrdal is 865 metres above sea level, while Flåm is by the fjord at sea level. In order to manage climb up the mountainside, the line twists and turns and has twenty tunnels to gain altitude; even so, the steepest incline of the railway is 1:18, the third steepest adhesion railway in the World. Like most of the other operational railway lines in Norway, Flåmsbana is a standard gauge (1435 mm) railway and electrified. Kjosfoss (669 metres above sea level) Trains stop at this station during the summer to let passengers get off the train to admire the Kjosfoss waterfall. There is no access to the station apart from the train itself. 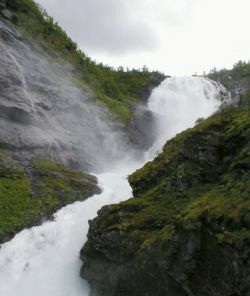 Flåmsbana is run by the company Flåmsbana AS which is owned by the local tourist industry and the local authorities. The rolling stock, with a dark green livery, consists of El17 locomotives which operate push-pull trains of old B3 carriages from the 1960s with rebuilt interiors to give a higher passenger density. This page was last edited on 26 February 2007, at 21:33.